The weatherman said that moderate rain with gusty wind will occur in different parts of West Bengal till Wednesday owing to the formation of a western disturbance over Chhattisgarh and Jharkhand. At least six persons were killed as heavy rain accompanied by thunderstorm lashed the city and other parts of the state early Monday, uprooting trees and snapping cables. According to the Met department, winds of 44-km-per-hour hit Kolkata and nearby areas at 3.55 am, followed by another gust with a speed of 56 kmph at 4.25 am. During this period, the city received 15.6mm rainfall. The minimum temperature recorded was 16.8 degrees Celsius, three notches below average, the department said. Two deaths were reported in Purulia and Sundarbans. The deceased have been identified as Abhishek Pandya (21) and Pradeep Tantabai (42). Abhishek, a resident of West Midnapore, had gone on a trip to Sundarbans with seven of his friends on a launch. He was standing on the deck when the storm hit, he lost his balance and fell into the river, sources said. He was taken to Basanti rural hospital where he was declared dead. Pradeep died when a temporary shelter he was sleeping in collapsed due to heavy wind. Mallika Naskar, a higher secondary student, died Sunday when she was struck by lightning in Baruipur in South 24 Parganas. She was rushed to the hospital where doctors declared her brought dead. Two farmers also died after they were struck by lightning in Keshpur and Kesiyari areas in West Midnapore. They are yet to be identified. Another person identified as Sheikh Kalu was electrocuted when he touched a lamp post when heavy storm hit Midnapore. The weatherman said that moderate rain with gusty wind will occur in different parts of the state till Wednesday owing to the formation of a western disturbance over Chhattisgarh and Jharkhand. Normal life was partially thrown out of gear on the first working day of the week, as trees fell on the roads, disrupting traffic movement. School children and office-goers had a tough time commuting on the thoroughfares, an official said. 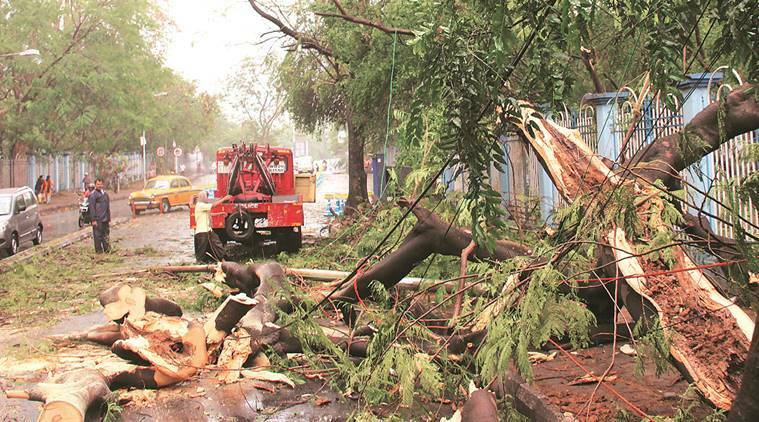 The Kolkata Municipal Corporation (KMC) and the Disaster Management Group, along with the city police, worked on a “war-footing” to clear the trees and the cables, he said. “We expect rain and thundershowers to continue across Kolkata and other parts of Gangetic West Bengal till Wednesday. By Thursday, rain intensity will go down significantly and the weather condition over most part of the state should improve. Good spell of shower with a wind speed of 45 km/hr is expected tomorrow and day after,” said Sanjib Bandopadhyay, senior official of meteorological department. As per officials, with the expected rain, Kolkata’s monthly average will be twice than normal in February.